Paper vietnam 2018 - the international exhibition on pulp and paper industry. 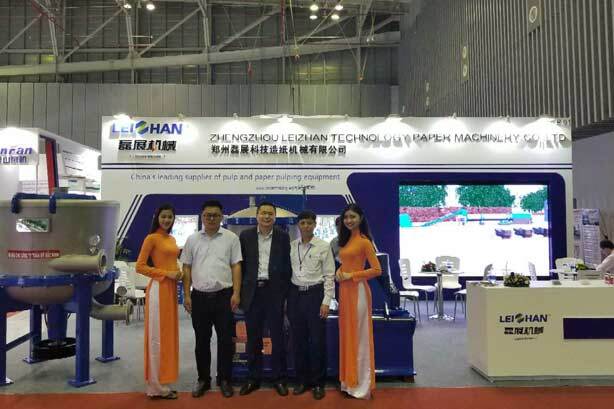 Leizhan is a professional manufacturer of Pulp& paper equipment. We engaged in in research and development, manufacture and sale, over 200 staffs, including 50 engineers and technicians. Annual Production and processing Capacity is more than US$15000000. What’s more, our company is developing rapidly, and we not only committed the production quality and technology of products, but also have better quality and comprehensive services in the late maintenance. Date: 13 -15 June, 2018. Location: SECC Saigon Exhibition and Convention Center Ho Chi Minh city, Vietnam. Ho Chi Minh, VietNam 7000 Viet Nam. Our company have complete set of conveying and agitating, screening, Slag removal, thickening and cleaning, pulping and refining equipment. So our company can meet every step of your paper making process. Our chain Conveyor, it has the advantages of large capacity, low motor power, less wear, reliable operation and high efficiency. Our Drum Screen, it has Simple structure but effective screening. Our Single Effect Fiber Separator can automatically discharge according your requirement. The Reject Separator of us compared with the vibrating basket screen, it can greatly improve the sorting efficiency and optimize the operating environment. The Double Disc Refiner of us can satisfy different beating degree of pulp for Paper making. The above products are just some of the good in our company, we have more better other paper pulp machines. You can come to this exhibition and experience our products by yourselves. Don’t miss the good opportunity to learn about our company, especially for the paper makers. I believe that our company can well meets all kinds of needs in paper making.